Programmatic advertising is no longer just a buzzword, but is here to stay. Having become mainstream in the West, it is now very quickly catching up in Asia. However, at times understanding the nuances of programmatic can be an uphill road. 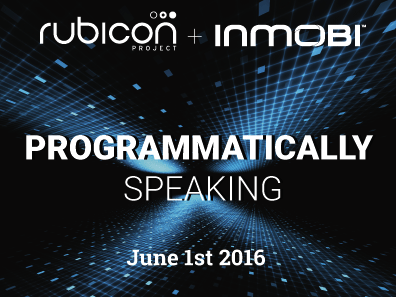 InMobi and Rubicon Project are co-hosting this webinar to help you understand the intricacies of programmatic advertising and how you can leverage the right partners to make the right decisions for you. Even if you cannot join the session, do sign-up and we will send you a recording of the webinar! Liam Lucas: Regional Director - Asia at the Rubicon Project. Liam is currenty the Director of Sales, APAC at the Rubicon Project. Vishal Dalal: Head - Sales Partnerships, India at InMobi. Vishal is responsible for managing Sales Partnerships entailing Programmatic, Resellers and Audience Extension.